Most people would agree that it's not just the actual race on race day that makes a race a good experience. I would have to say that sometimes it's a lot of the extra stuff that goes in to it before and afterwards. 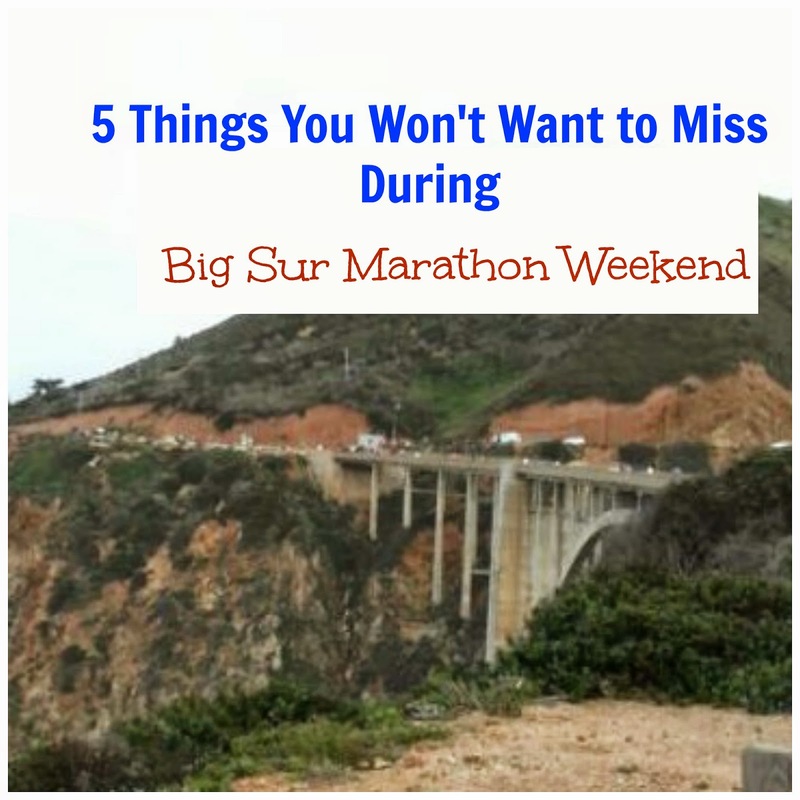 For this Friday's 5, I'm sharing the "extra" things I liked about the Big Sur Marathon. I arrived at the race expo as excited as I always do. I was ready to get some race swag. The Big Sur expo is a fairly decent size. It's not small, but it's not too big that you will feel overwhelmed. You are sure to be able to see everything. 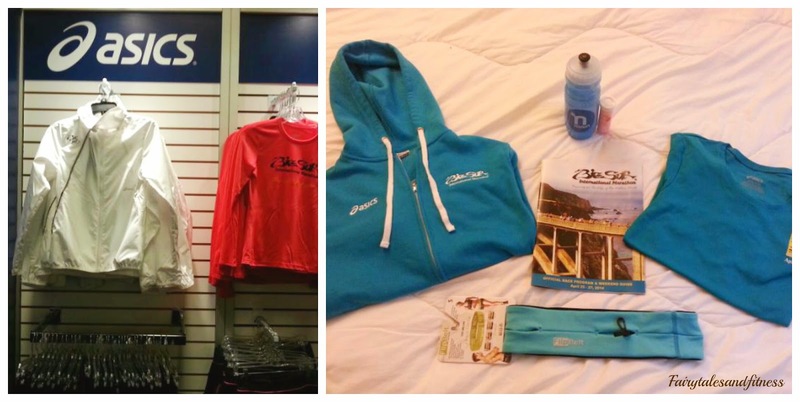 I first stopped at the Big Sur merchandise because I know that it was quick to sell out of certain clothing (well at least in my size) last year. I was a bit disappointed this year of their selection. Last year I bought a tech zipper down that had thumb holes around your hands. I liked it so much, that I wore it all the time, and I misplaced it. I was hoping to get another one of those, but they didn't have any. The closest they had was a white zipper down wind breaker that was very thin because there was no lining in it. I did find a nice blue zipper down sweatshirt that's very comfy, so that's what I bought. Next it was over to purchase a flip belt. I have heard many great things about this product and wanted to try it out for myself. They say you shouldn't try anything new race day, well I did. (A later post to come about this product). I then went over to snuggbuds. 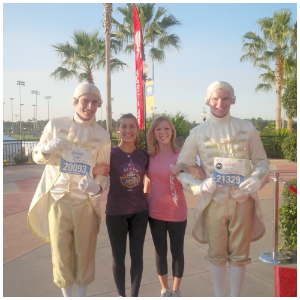 I had just purchased a pair when I was down for the Princess half marathon in February. On the plane ride here the cord got frayed and the music became staticy. Snuggbuds says that they will replace your snuggbuds within 6 months if they stop working, however you are suppose to have the case you purchased them in. I did not, but they were very nice and still honored an exchange. I didn't spend too long at the expo the first day, because I knew I would be back the following day to listen to the speakers in the afternoon. 2: Listening to the speakers.When I arrived at the expo the second day, the first session I attended was What are your course questions? 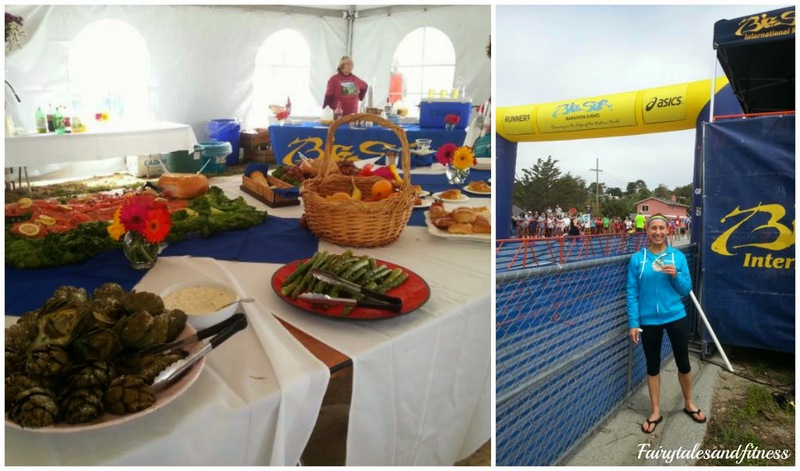 There was a panel of veteran Big Sur runners to give you tips on what to expect and do and don't along the course. Even though this was my second Big Sur marathon, it was still very informative to hear. The panelist included Jeff Galloway, Bart Yasso, Dean Karnazes, and Lee Scott. The next session was Run like a Girl with the ladies from Runner's World. 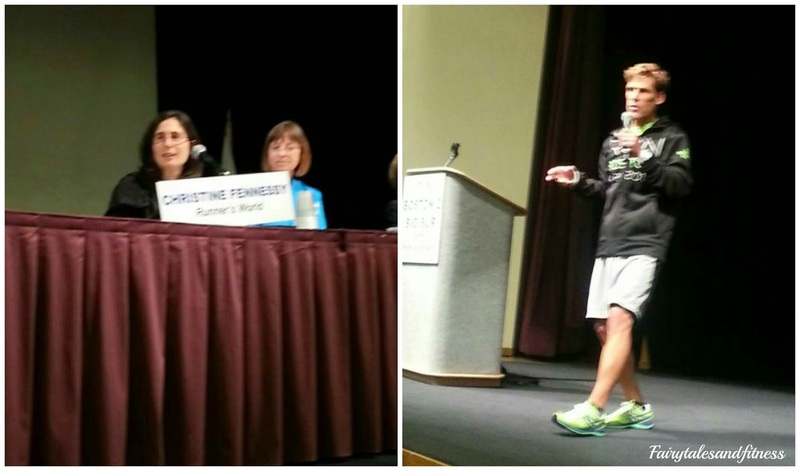 The panelist included Tish Hamilton, Christine Fennessy, and Jen Van Allen ( co-author of the Runner's World big book of running for beginners). Barbara Galloway (Jeff Galloway's wife) and Susan Love (director of the Just Run Program and VIP program coordinator for Big Sur) also spoke. I really enjoyed this session since it was focused for women. 3. Meeting the professionals: Then it was Bart Yasso's time to speak. He is the chief running officer of Runner's World magazine ( Which I'm sure you already know). I have listened to him speak at several expos but it is always nice hearing about his experiences during his many races. I was even able to meet him and he signed his book "My Life on the Run." I've heard many great things about this book and am excited to start reading it. 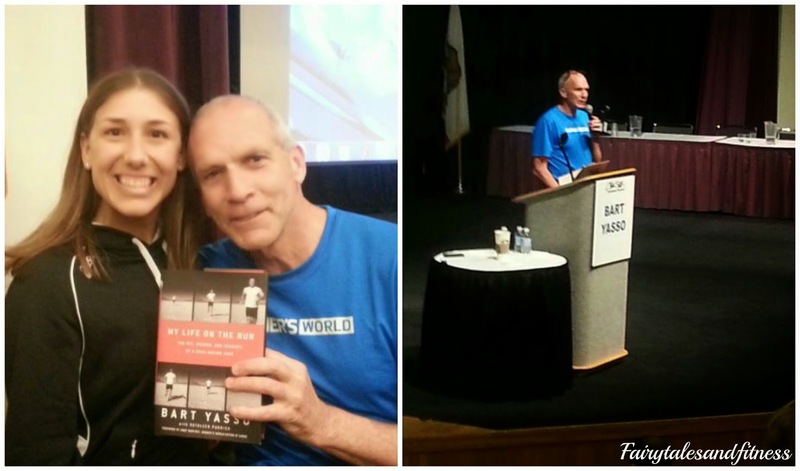 Later I listened to Dean Karnazes speak. His session was to tell runners how to tackle the Boston 2 Big Sur Challenge. Even though, I didn't run both this year, it was great hearing him speak. He also told some of his crazy stories of being an ultra runner. He said he goes through 30-40 pairs of sneakers a year. WOW! He is very grateful to have sponsors. His goal for 2015 is to run a marathon in every country in the world in one year, which would be over 200! 4. Pre Race Pasta Party: That evening we went to the pasta party to carb up for the big race the following day. There was a small band that played during dinner and the race director spoke and answered any questions you may have had about the race. 5. Post Race Celebrations: Immediately after the race there was a VIP tent that I was invited to. 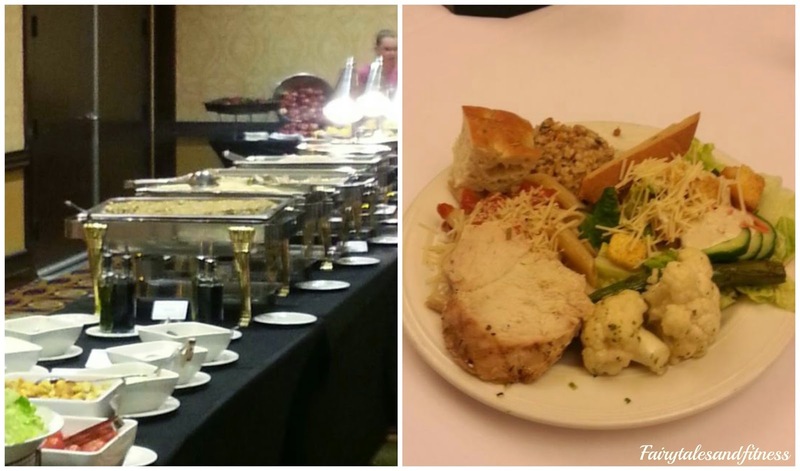 In here they had a large spread of salads, pastas, and different meats. They had a wine table set up, along with a bloody mary bar. This tent was located right next to the finish line so we had a great view of all the runners still finishing. And a perfect photo opportunity at the finish line. The night of the race was the post race party. This was not a dinner buffet like the pasta party, but hors d'oeuvres. Even though, it wasn't a dinner, there was plenty of food there to choose from and it was very yummy. 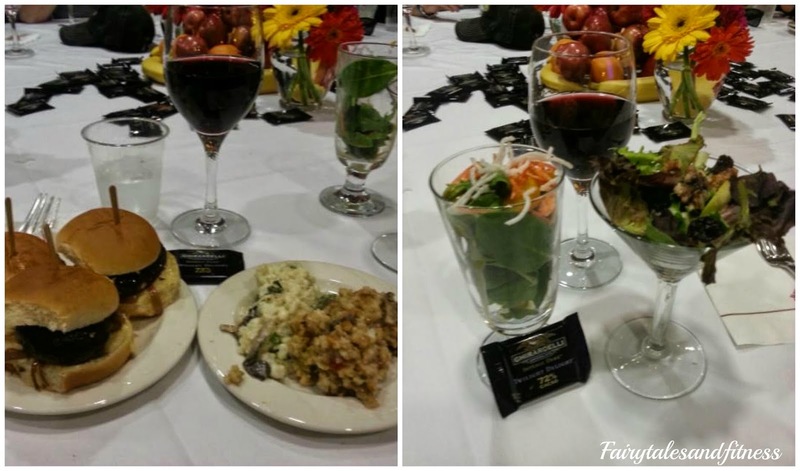 There were many different salads and sliders (chicken, beef, and Portobello mushrooms). Each post party ticket came with one complimentary beer or wine as well. During the party there was a big screen that continually rolled with pictures of race day. The race director spoke again and all the board members of the committee were acknowledge for all their hard work throughout the weekend. It sounds like Big Sur was a great marathon with lots of nice extras. Of course I love the expo experience and most of all, I love traveling to new places for races so there is usually sightseeing involved, oh and some fun meals and if you are with crazy girls like I was last weekend, there might be the start of a dance party! Yes, It was very nice traveling there, even though it wasn't a new place(since I was there last year) it was still a lot of fun. Gotta love a racecation! I never seem to get to the expos to see any speakers or presentations. I need to plan that better. Looks like a fun time. I don't normally sit around all afternoon listening to the speakers. However, this panel was great and very informative. I really enjoyed it. All the extras at this race sound amazing! The lectures sound like a great opportunity and it's cool that you were able to meet some of the experts afterward. Yes, I love being able to meet the people afterwards. They are so down to earth. I'd rather meet some one like that who is inspirational than an actor..haha. I think the post race celebration is always my favorite, especially if it involves a massage booth! Yes it was very nice, especially after just finishing a hard marathon as this one. 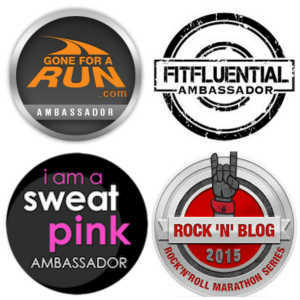 I think every marathon should offer this complimentary and then give an option to continue longer if you pay. I think more people would end up doing it. Do you remember what was said at the "run like a girl" presentation? That sounds the most interesting in general. Yeah, it was my favorite, since it was based towards women. So Christina is a competitive cyclist and she was saying how it helps her running and she loves to do it because she doesn't feel like it is as competitive as cycling. Jen was talking about how your body changes after having a baby, and how you have to redefine your success. Barbara talked about her run/walk method. And Susan talked about how when she started running back in the day, that it was frowned upon and wasn't accepted. There was a lot other random questions about how to deal with menopause and keeping your energy up as well. Other than expo shopping, I don't really do the extras connected to the race. Back when I first started running, my run group always had a dinner the night before a run. I do kind of miss that, but I'm usually out there solo these days, so the race pasta parties seem like they'd bey awkward. That looks like quite a spread, though! This marathon is on my to-do list! I hope I get to do it one day! Yes, definitely a bucket list. They are trying something new this year. Instead of having one day for registration it is going to be broken down to different days and different times. Hopefully that will give other people more options to register since it sells out all the time. Yes it is. This is one of my favorite expos I have ever been to. I always look forward to the expos during race weekend. I love to browse all the new products and of course, spend more money! Me too! Each expo is unique in its own way. 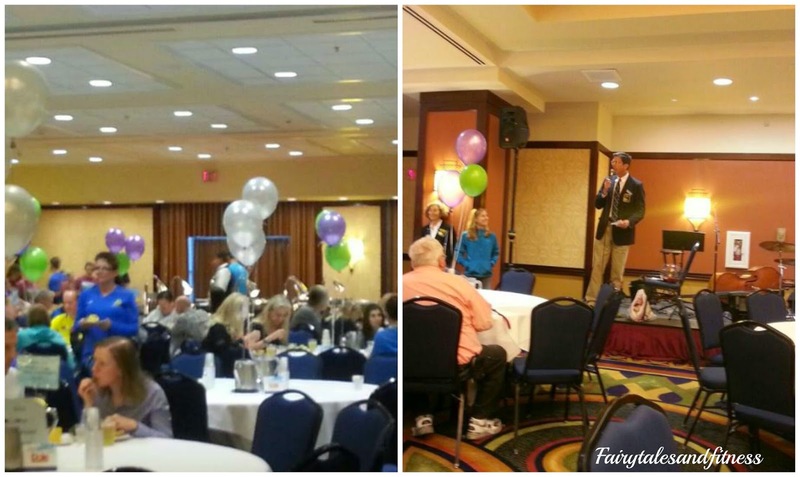 Wow, that post race party looks amazing! Yes it was a lot of fun. The food was very yummy! It sounds like Big Sur has all kinds of fun extras! Yes it does, if you take advantage of them. I think that is one of the reasons it stands out from many other races. Well, congrats on Big Sur again. What an amazing experience - both the course and also the extras. You got to hear some pretty great people speak all in one place. I don't usually hang around for a whole lot of stuff other than the race, but I do smaller less exciting races, lol. I will say that I get more excited over post race food than I do the bling. Ha! I love dedicating the things you like to the OTHER stuff - it makes me want to run that race even more! Yes, it's a great race! Put it on your bucket list! I never take advantage of the speakers at the expos - I should make a point of doing that at least once or twice! A good expo is always important, although sometimes it can be overwhelming! (ahem....Princess 2014). I also enjoy seeing the swag different races provide....sometimes you get some really cool/interesting stuff! Everything looks like so much fun! How cool that you were able to meet Bart Yasso! Love all that gear you got!